Production: Wega-Film, Vienna; distributed by Metro Tartan Distributors; first released 14 May 1997; color; sound: Dolby Digital; running time: 108 minutes, 59 seconds; length: 9,808 feet. Producer: Veit Heiduschka; screenplay: Michael Haneke; photography: Jürgen Jürges; assistant director: Hanus Polak, Jr.; editor: Andreas Prochaska; art director: Christoph Kanter; sound: Walter Amann; sound editor: Bernhard Bamberger; special effects/makeup: Waldemar Poktomski; Simone Bachl; special effects/stunts: Mac Steinmeier; Danny Bellens; Willy Neuner; costumes: Lisy Christl; wardrobe: Katharina Nikl; mixer: Hannes Eder; production manager: Werner Reitmeier; united production managers: Alfred Strobl; Phillip Kaiser; post-production: Michael Katz; Ulrike Lasser; script supervisors: Katharina Biro; Jessica Hausner; animals: Animal Action; dog trainer: April Morley. Cast: Susanne Lother ( Anna Schober ); Ulrich Mühe ( Georg Schober ); Arno Frisch ( Paul ); Frank Giering ( Peter ); Stefan Clapczynski ( Georg "Schorschi" Schober ); Doris Kunstmann ( Gerda ); Christoph Bantzer ( Fred Berlinger ); Wolfgang Glück ( Robert ); Susanne Meneghel ( Gerda's sister ); Monika Zallinger ( Eva Berlinger ). Awards: Silver Hugo award for Best Director, Chicago International Film Festival, 1997; International Fantasy Film Special Jury Award (for Michael Haneke), Fantasporto (Portugal), 1998. Romney, Jonathon, "A Trial by Cinema," in The Guardian (London), 15 May 1997. Haneke, Michael, "Believing Not Seeing," in Sight and Sound , LFF Supplement (London), November 1997. Hoberman, J, "Head Trips," in Village Voice (New York), 17 March 1998. Falcon, Richard, "The Discreet Harm of the Bourgeoisie," in Sight and Sound (London), May 1998. Film Ireland (Dublin), August/September 1998. Cinema Papers (Victoria) October 1998. Andrew, Geoff, "Hurt of the Matter," in Time Out (London), 21–28 October 1998. Time Out (London) 28 October-4 November 1998. Sight and Sound (London), December 1998. Engleberg, Achim, "Nine Fragments about the Films of Michael Haneke," in Filmwaves (London), Winter 1999. A celebrated writer and director of television and theatre in Austria, Michael Haneke first grabbed the attention of the international film community with his trilogy of films reporting on "the progressive emotional glaciation" of his country. Manifesting his hatred for the kind of sensationalized violence that, he believes, induces audience passivity, each film was designed to show how desensitization leads to societal alienation and dehumanization. The first, The Seventh Continent (1989), focused on a family's collective suicide; the second, Benny's Video (1992), examined a boy's fatal relationship with a girl and his video-camera; the third and most accessible, 71 Fragments of a Chronology of Chance (1994), foregrounded the senselessness of motiveless murder and suicide. 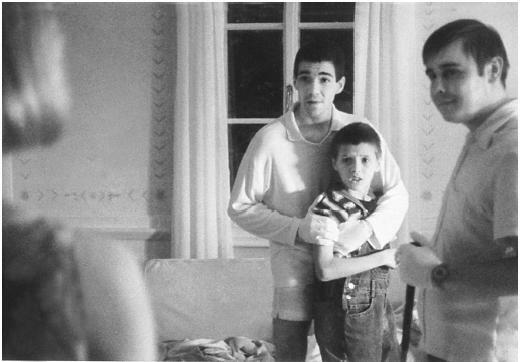 With Funny Games Haneke went one step further to provoke his audience into considering their relationship to, and consumption of, screen violence. Challenging the conventions of the thriller genre itself, the film confounds expectation and keeps the majority of the violence off-screen, heard but not seen, witnessed only by us through the reactions of the other characters. It is this manner of stylization that most divided critics upon its release. While some were eager to praise the film for its daring originality, others accused it of being both manipulative and patronizing in its tone and approach. The narrative of the film is simple and centers on a middle-class couple and their son whose idyllic holiday in their lakeside retreat is interrupted by the arrival of two anonymous, well-spoken youths. Wearing clinical white gloves and calling themselves Peter and Paul (or, with referential irony, Tom and Jerry, Beavis and Butthead), the youths proceed to subject the family to a night of mental and physical torture, referring to each act as a game. Sign-posting some classic horror/thriller conventions, the film opens upon the tranquillity of an ordered world that is soon to be disrupted by the threat of the unknown. Listening to classical music as they travel by car through the country lanes, the family is coded as safe and bourgeois. At this stage they remain blissfully unaware that, as a portent of the sudden and alarmingly vicious acts to follow, their music is being drowned out by screamingly chaotic heavy metal. Yet despite these early warning notes the film is otherwise relentlessly measured in its slow build up of tension and execution of events. Although the situation itself seems bizarre, emphasis is placed on the realism of the family's reactions. When the son, Schorschi, is shot (his blood splashed symbolically over the television set) and the youths apparently leave, the camera fixes in excruciatingly long takes—first of the mother, Anna, and then of the father, George. Rather than attempting an immediate escape they sit motionless, caught up in their own personal humiliation and despair, too wounded to move. To further test the viewers' perceptions of reality, Haneke seeks to increase awareness of the film's fiction. Paul, the more dominant of the psychotic pair, occasionally makes post-modern asides to the camera, psychologically taunting us as much as he taunts the family. "What do you think?" he asks, having told his victims that they will be dead within twelve hours, "Do you think they have a chance of winning?" When Anna manages to grab the shotgun and shoot Peter, he picks up the remote and rewinds the film, bringing his partner back to life again, thereby changing the course of the narrative. At one point he winks towards the screen as if to include the spectators in his game—a hint from the filmmaker that by continuing to watch they make themselves responsible for the perpetration of screen violence. Upon the release of Funny Games Haneke contentiously declared that "anyone who leaves the cinema doesn't need the film, and anyone who stays does." Bearing in mind the director's desire to educate, the problem with this film is its effectiveness. Although very different from most other horror/thrillers it is a worthy addition to the genre, ranking alongside other experimental works such as The Texas Chainsaw Massacre , Man Bites Dog and Henry, Portrait of a Serial Killer. Shockingly frightening and nihilistic, the spare visual style and subtle insinuation mesmerizes and intrigues rather than discourages. The manner of the two youths is extremely disquieting. These are not the archetypal villains whose behavior is a result of a terrible childhood or trauma—they play merely because they can, because they are bored of their middle-class existence and can no longer maintain any normal human connection. There is also a great sense of loss when the final member of the family to be killed, Anna (played by with devastating sincerity by Susanne Lothar), is pushed into her watery grave. The act finally makes real what has been a suspicion for the last third of the film, that the captors will get away with their crime and, contrary to any hopes and expectations, none of their victims will manage to survive. Whether or not the central message of Funny Games will make any practical difference to the way in which violence is either presented on the screen or received by its viewers remains to be seen. One suspects not, for as an arthouse rather than a mainstream hit it clearly has a limited audience. The wider audience it seems keen to preach to will therefore remain unconverted while the rest, contrary to Haneke's wishes, will stay in the cinema, continuing to view both this and other violent films out of an "academic" interest.